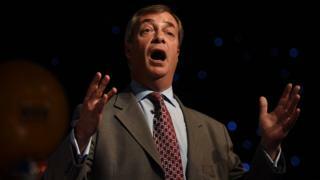 A no-deal Brexit is "no problem", Nigel Farage has said at a rally of the Leave Means Leave campaign group. The former UKIP leader told an audience in Bolton the current government negotiations on Brexit could plausibly end in an agreement. But "far from being a cliff edge", the UK would prosper without one, he said. Ex-Brexit Secretary David Davis told the rally the PM's plans were a "weak compromise" and the government had to deliver Brexit "without dilution". Mr Farage said the majority of the "political class" did not respect the Brexit vote and the "endless negative narrative" needed to be countered "again". "They do not want to give us Brexit," he told the rally at the University of Bolton Stadium, the first in a number of Leave Means Leave events across the country. The MEP said of the EU: "They are a bunch of gangsters. We will explain a free trade deal is possible, if that's what the gangsters in Brussels want. "If they don't, that is fine, if they don't we will leave with no deal. No deal, no problem." Theresa May's plan for Brexit - known as the Chequers agreement - was rejected by EU leaders as unworkable at a summit in Salzburg on Thursday. Mrs May later said the EU's rejection of her plan without offering an alternative was "unacceptable" and made it clear she was ready to walk away from the negotiations rather than accept a "bad deal". Mr Farage criticised the Chequers proposals, saying they were "dead" and do not work for the EU or the UK. Mr Davis had been leading the UK negotiations to leave the EU but quit the cabinet in July, saying he did not "believe" in the Chequers plan. He told Saturday's rally: "We have nothing to fear and that is the reason why we should only accept a clean and clear Brexit, not some fudge." Mr Davis also said he viewed the EU's treatment of Mrs May "with contempt", adding: "Bad manners and discourtesy are not the hallmarks of great men." He continued: "And if you think you can bully our country, all I can suggest is that you read some history books." Labour MP Kate Hoey also spoke at the rally, saying: "We don't need another vote - we just want to leave." "Our vote matters and we won't allow it to be stolen from us," she said. She also said Brussels had never negotiated Brexit in "good faith". "They underestimate how strong we are when we are up against it," she added. It was a full house at the University of Bolton Stadium. An audience of more than 2,000 people squeezed into what was decked out like a ballroom. A stall selling Leave Means Leave baseball hats did excellent trade. In Bolton, 58% voted to leave the EU in June 2016 and, as they queued to get in, many told how passionate they were to secure the kind of Brexit they voted for. They said they felt the result of the referendum was not being taken seriously enough. The audience had come from around the country, some waved union flags; others wore them. The loudest of the applause was reserved for Nigel Farage who started by saying: "I didn't think I'd have to do this again." That got laughs. Earlier he took an open top bus into Bolton to speak to shoppers and market traders, the media in tow. It all felt a bit like going back to the referendum campaign.